As a rule, woodpeckers dig out cavities in dead trees, called snags. Once construction is done—they move in. The exception occurs when they mistake your home’s wood siding, for a snag. When they do—homeowners have problems. And it looks like cannon balls have been shot through the house. Maybe two or three; and we’ve seen some with fifteen, sixteen holes. Cliff Shackelford is a non-game ornithologist with TPW. He says woodpecker damage occurs most often in urban and suburban areas where homeowners have removed the dead trees from their property. What we recommend people to do with problems with woodpeckers is to put a nest box. If you’re familiar with a bluebird box, it’s just a larger version of that custom made for woodpeckers. Find information and free blueprints to make your own woodpecker nest box at passporttotexas.org. People can build this in a couple of hours on the weekend, and put it up on the side of the house, and in all cases that we’ve done this – it’s worked. And the woodpecker stops chiseling on the home, and goes to this next box, and is very content. If you live in East Texas, and have noticed strange holes in the wood siding of your home, don’t panic and call the police—call an ornithologist. 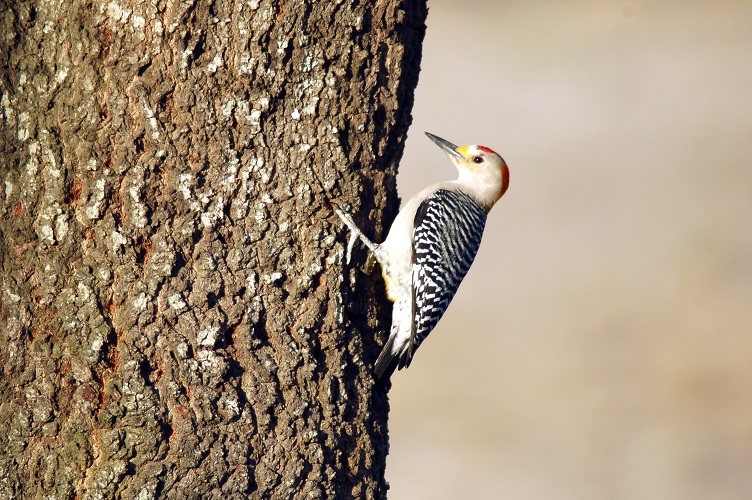 There are fifteen species of woodpeckers in Texas, eight of which are in the eastern third of Texas. And that’s where we get most of our calls of woodpecker damage. 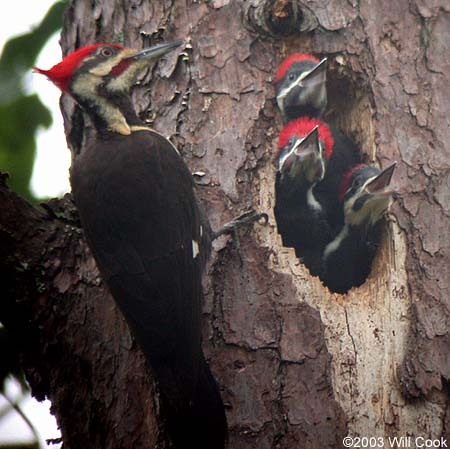 Non-game ornithologist, Cliff Shackelford, says the pileated and red bellied woodpeckers are among the feathered culprits inflicting damage on homes with wood siding. What happens a lot of time is that they see these houses that might be painted brown, they might have cedar siding, and this is very attractive to the birds to try to excavate a cavity. So, they’re not looking for food when they’re doing this; they’re looking to make a cavity to call home. The pileated woodpecker, about the size of a crow, can excavate holes as big as a man’s fist—and not just in the outside walls of your home, either. That’s right. We’ve documented pileateds going through into the sheetrock and into the room of the house. Of course, they’re very lost when they do that, they quickly go out. They’re not looking to make a mess of the house. But they do. How to keep woodpeckers from damaging your home…that’s tomorrow. You may be tired of eating those heavy, Thanksgiving leftovers by now. If that’s true, it’s easy to find a nearby fishing hole where you can reel in something light, fresh and delicious. Chef Cindy Haenel says there’s nothing like catching your own dinner. It’s fabulous. I know exactly how old that fish is, when it came out of the water and how long it’s been dead. And that’s important with fish especially. Fresh is always best. 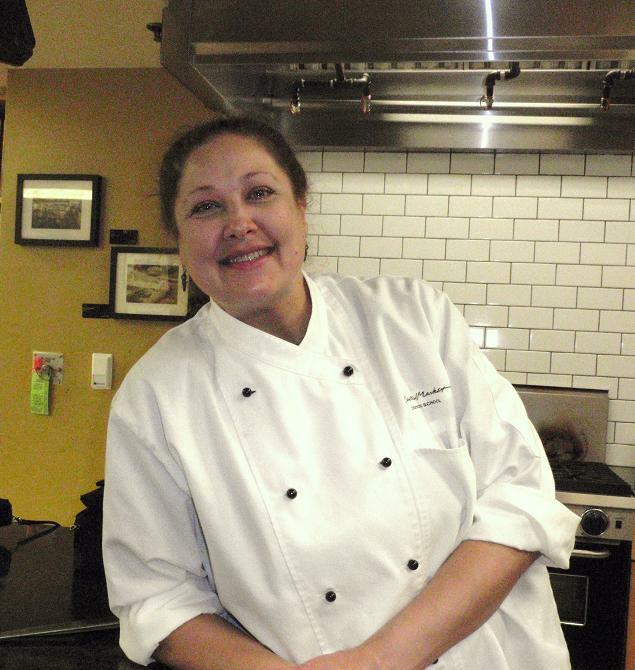 Cindy, an avid angler, is a chef instructor at Central Market in Austin. I love the saltwater as well as freshwater. But the saltwater you have more variety. You never know what you’re going to pull up. It’s exciting – like Christmas morning. Immediately place your catch on ice, and if there’s a cleaning station on shore, Chef Cindy says consider doing the dirty work there. And when you get your catch back to the kitchen, be careful not to overcook it. Most people, if they don’t like the taste of fish, it’s probably because they’ve overcooked it. And, as it cooks, and the oil of the fish starts to come out of the flesh, it burns very, very quickly. So, if you will undercook your fish, or protect that fish with either a salt crust, or even if it just has a little butter, or some kind of fat on the outside it still protecting that fish while it’s cooking. Find fish recipes from Chef Cindy as well as a link to other fish and game recipes at passporttotexcas.org. The Sport Fish Restoration program supports our series and works to increase fishing and boating opportunities in Texas. Heat a large skillet over moderate heat. Combine egg and milk in a tin pie plate, beat with a fork. Place a cup of flour in a second pie tin and season well with salt and sparingly with pepper. Coat trout fillets in egg and milk, then in seasoned flour. Collect fillets on a plate until all of them are dredged and ready to be cooked. Add 1/2 tablespoon extra-virgin olive oil to your skillet. Add 1 1/2 tablespoons butter to the pan. When the butter foams, add trout and gently saute 4 fillets for 2 or 3 minutes on each side, until golden. Transfer trout fillets to warm platter in oven. Return pan to the stove and add 1/2 tablespoon extra-virgin oil and 1 1/2 tablespoons butter. When butter foams, repeat cooking process. When all of the trout is cooked, add last tablespoon of butter to the pan. When the butter melts, add almonds and brown until lightly golden, 1 to 2 minutes. Remove trout from oven and pour almonds over the platter. Garnish platter with chopped parsley, lemon wedges, and serve immediately. When was the last time you went fishing? Fall weather makes spending extended periods of time outdoors more pleasant, but beyond that: fishing is simply great this time of year – saltwater and freshwater. While Hurricane Harvey stirred things up along the coast, saltwater fishing is shines this time of year. Red drum—or redfish—are favorites of coastal anglers as they migrate into the beachfront waters of the gulf for their annual spawn. According to veteran anglers, autumn is an ideal time to cast for tarpon and snook, too. You’ll find those farther south. Not a saltwater fisher? No worries—there’s plenty of action in freshwater during the cooler months. With more great bass lakes than you can shake a stick at, expect to reel in some big fish as they move to shallower waters in fall. Remember: if you reel in a largemouth bass weighing 13 pounds or more, consider donating it to the Toyota Texas ShareLunker program for use in the spawning program. Some bass lakes to visit this fall include Lake Fork, Falcon Lake, and Choke Canyon Reservoir. 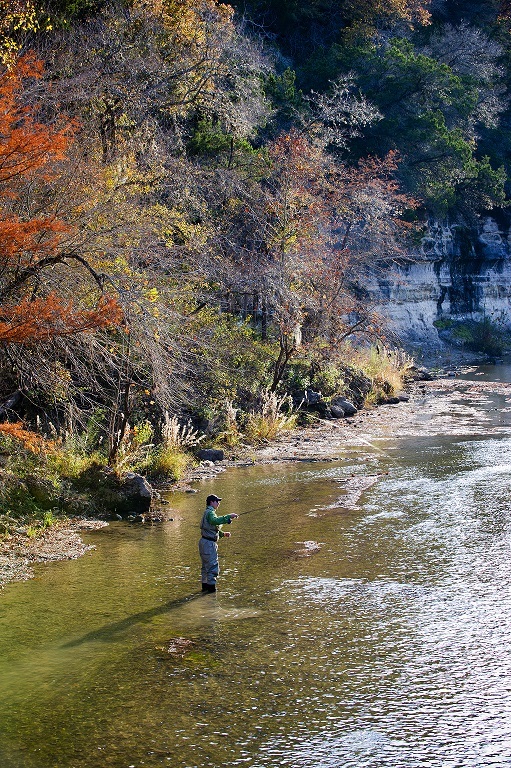 Any time is a good time to fish in Texas, and fall may just be the best time. To coax the best flavor from the deer hunters harvest this fall, proper care from field to plate, is a must. Just ask Marcus Paslay. He’s chef and owner of Clay Pigeon Food & Drink in Fort Worth. Every step of the way—the way it’s handled—drastically affects flavor. You know, in the field, it’s something you want to get cleaned out as soon as you can, and get it cold as soon as you can. It keeps that flavor a little bit more clean. A bit more clean, and a lot less gamey – but not without some gaminess. It is an acquired taste. So, I think whoever’s eating it is going to have to have a sense of adventure to a certain extent. But there are ways to overcome it a little bit. I always like using brines. Soaking the meat in a sugar, citrus, salt bath overnight—or whatever it takes. That really helps out well with big game such as venison, or hog. Brining is just one method Chef Paslay uses to impart flavor into game. Another way I really love on venison is rubbing it down with coffee grounds. And the tannins in the coffee help break down the proteins and they also impart a pretty strong flavor themselves, which masks the gaminess of the meat. 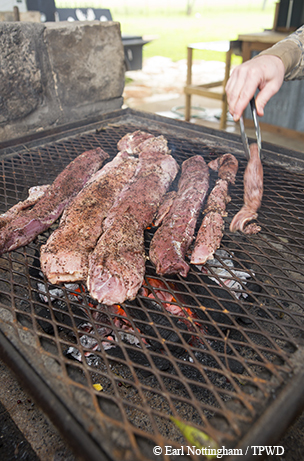 Find a link to Chef Marcus Paslay’s recipe for coffee rubbed venison loin at passporttotexas.org. You are currently browsing the Passport to Texas weblog archives for November, 2017.